From the 20-time award-winning company that brought you Beau & Aero and Bella Culpa (Edmonton Fringe Best of Fest 2015, 2016) - a show about two sisters of faith struggling to find the light...and stay in it. An absurd comedic look at the lives and habits of Sisters Florence and Margarine and the temptations they face. SINsational! NUNsensical! POPEular! Mind ALTARing! The Holy Grail of Comedy! We pray you'll join us. 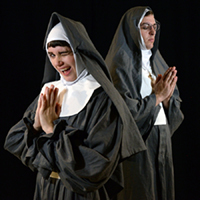 The Portland duo who have been at the Winnipeg Fringe before, with “Beau and Aero” and “Bella Culpa”, bring a new comedy show about nuns. It is hilarious due to the physical comedy, the interplay between the characters and how they constantly break the 4th wall to engage the audience and make light of the script absurdities and the nuts and bolts of doing a live show. Those of you who are familiar with them will know that they are gifted acrobats. They do not disappoint, ramping up the difficulty by doing some very difficult balancing while on hoverboards. Flying nuns indeed. It really is a lot of fun. WECC has a Fringe Special of $5 adult beverages, for those who might not be so pious.